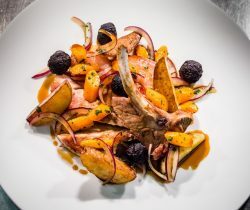 This amazing Roasted pork chop with black pudding and new potatoes recipe combining the taste of succulent pork and rich herby Black Pudding, Pale all gravy and new potato wedges created by Adam Grey, this recipe can be found on Great British Chefs website along with others. This easy yet delicious recipe takes about 45 minutes to make and serves 4 people. 1. Bring the Chicken stock to the boiled and allow to reduce by half. In a separate pan bring the pale ale to the boil and reduce to a third. 2. Add the reduced ale into the reduced chicken stock pan, along with the thyme and sage. Bring back to the boil and simmer gently for 10–15 minutes. Sieve to remove herbs then set aside for later. 4. Heat a frying pan to a medium heat, season the pork chops on both sides with the salt and white pepper. Add about 50ml of the rapeseed oil to the pan. Seal the Pork chops on both sides until Golden Brown. 7. Drain the potatoes into a colander, once cool enough, slice into wedges. 9. Add the black pudding pieces and cook for 2-3 minutes. Turning occasionally. 10. Add the sliced red onions and the baby carrot pieces and fry everything together for another 2 minutes. Add chopped parsley.